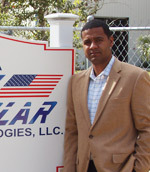 Alternate Energy Technologies LLC (AET), established by company founder, President, and managing partner Billy Byrom in 1987, is the U.S. solar thermal industry‘s leading manufacturer and integrator of solar energy solutions. AET manufactures a variety of state-of-the-art flat plate solar thermal collectors, solar pool heating panels, and water heating systems (including tanks, pumps and controls, and system components) for both residential and commercial use. AET also has a full-service engineering and design team offering services including material selection, engineering analysis, thermal considerations, ROI, paybacks, system designs and complete solar thermal solutions. The company provides certified and accredited training programs (solar thermal and electric) providing in-depth coverage of the fundamentals, installation, design and sales of solar systems using a hands-on format. 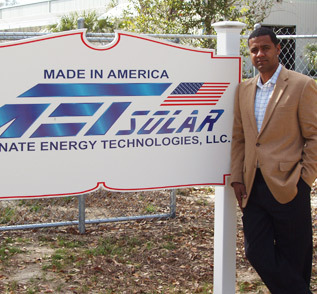 In late 2012 when AET initially approached the Florida SBDC at the University of North Florida (UNF) for assistance in exploring new international markets, the company employed forty-nine employees, though none handled international orders. International sales comprised less than 5 percent of the company’s annual sales. AET decided to increase revenue from exports in order to mitigate the risk of domestic market disruption due to the political uncertainty affecting tax credits for solar energy in the U.S.
To that end, AET was accepted to participate in the Export Marketing Plan Service. The Export Marketing Plan Service is a collaboration among the FSBDC, Enterprise Florida, and the U.S. Commercial Service in which the FSBDC develops a comprehensive, data-driven, tailored export marketing strategy for qualified Florida small businesses. Once the plan is delivered, participants have the opportunity to apply for a reimbursable Target Sector Trade Grant from Enterprise Florida to help cover some of the costs of exhibiting at an overseas trade show (up to $6,000). Companies may also apply for a reimbursable Gold Key grant from Enterprise Florida to cover the cost of one single standalone one-on-one business matchmaker (such as a Gold Key) in a market recommended in the Export Marketing Plan. FSBDC business consultant Diane Denslow developed a comprehensive plan including extensive industry research and international market metrics to identify top markets for AET products. The plan was presented to AET Executive Vice President Andrew East in August 2013. Since that time, the company has increased sales from exports by 500 percent with total company revenue from exports being over 25 percent in 2013 and trending toward 30 percent in 2014. AET is currently hiring a representative in the Dominican Republic, and two in-house customer service representatives that will be dedicated to export sales. The company has opened new markets in Jamaica, British Virgin Islands, Costa Rica, South Africa and proposed markets in India since participating in the Export Marketing Plan Service. East attended the spring 2014 Enterprise Florida trade mission trip to the Dominican Republic, resulting in a project pipeline of over $500 million. He now works closely with FSBDC at UNF International Trade Specialist Katie Arroyo to stay abreast of international trade networking events and information to help him further explore new markets for AET technology. "I have and will continue to recommend the SBDC [and the export marketing plan service] to every business owner and entrepreneur that I encounter as I believe that their services can help build a stronger economy one small business at a time."